From the brushed stainless-steel headband and ear-cup accents to the matte black or white housings, and from the embossed, metallic JBL logos to the cable that matches the ear pads, these headphones are designed to be as pleasing to the eyes as they are to the ears. JBL drivers deliver precise, powerful sound for an exceptional listening experience. Bass is pure, deep and accurately produced – the calling card of legendary JBL sound. As a result, J55a headphones outperform competing products costing much more. Sometimes you need to be aware of more than just your music. J55a ear cups rotate up to 180 degrees while you’re wearing them, so you can keep one ear on your audio and one ear on external sounds or conversations. 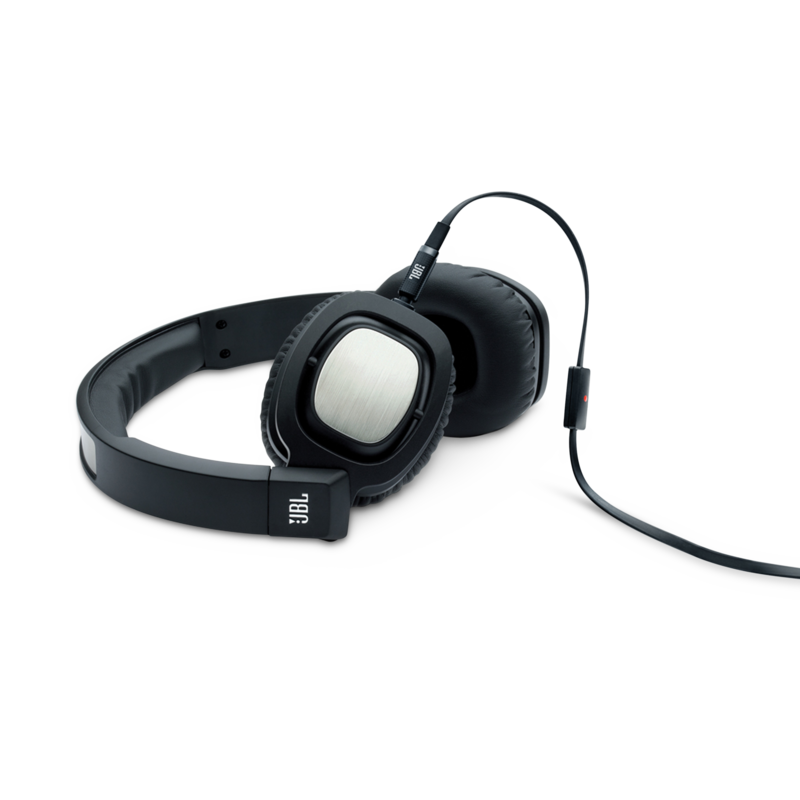 The ear cups rotate under the headband for easy storage and transport. Our ear cushions feature a soft leather that provides long-wearing comfort. It also helps maintain an acoustic seal on the ear, which improves the headphones’ passive noise reduction. And that means a purer listening experience. J55a headphones feature a closed-back design that blocks ambient noise and minimizes leaking. So the outside noise stays outside, and your listening experience stays yours and yours alone. Made for use with Android devices, the in-line remote offers standard playback functions. A built-in microphone lets you answer calls with remarkable clarity while leaving the headphones on. Tangled cables are a constant source of frustration. But not with the J55a’s. Their tangle-resistant, flat elastomer cable connects to just one ear cup, which further minimizes tangling. The cable also detaches from the ear cup for added flexibility. A unique twist-lock mechanism keeps the detachable cable secure when it’s connected. When you plug the cable into the ear cup, a simple twist locks it in place. A strong, secure connection between the housing and the cable is critical for both durability and sound quality. Our rugged strain-relief connector dampens vibration for enhanced acoustic performance. The gold-plated jack incorporates an extension ring that works with most custom smartphone covers and cases. So you don’t have to slip off your protective case to connect the headphones. JBL sound is always worth protecting. An included padded carry pouch keeps the headphones safe from bumps and bruises when you’re not wearing them. Acoustic performance that outclasses the competition. For over 60 years, JBL® engineers have crafted the precise, naturally articulated sound found in cinemas, arenas and recording studios around the world. 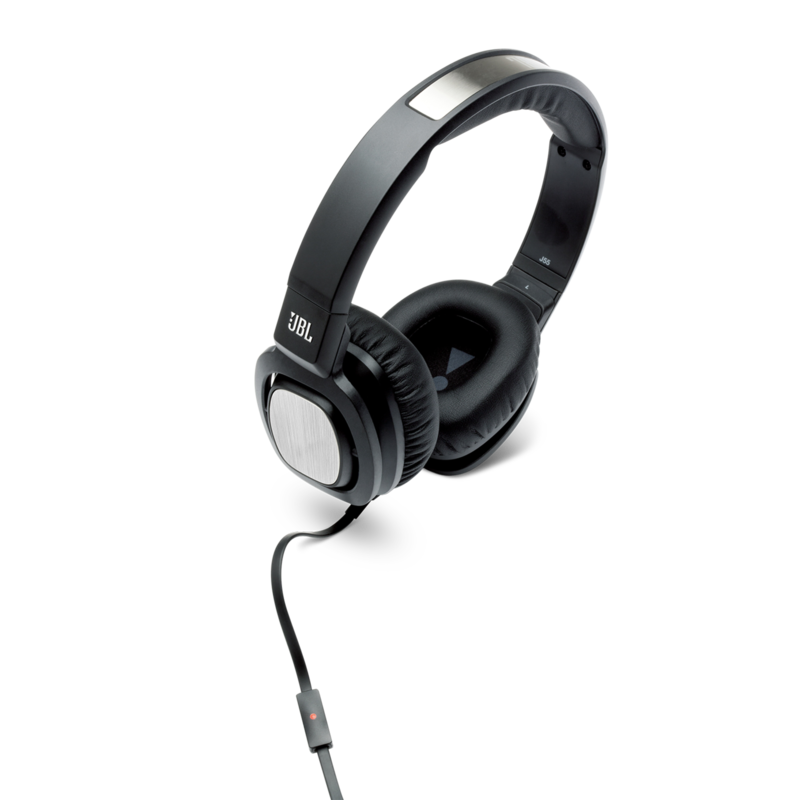 That legendary JBL sound is now available anywhere personal audio travels. 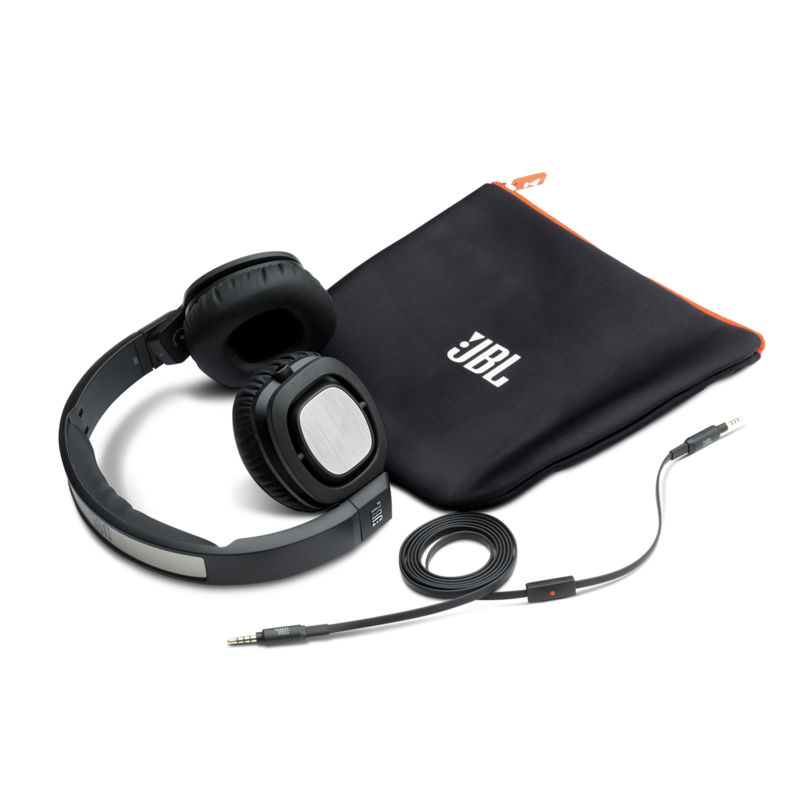 JBL J55a headphones employ premium drivers that generate pure, accurate, extended bass that competing products simply can’t touch. Superb clarity enables you to hear the truth from your music. Our unique DJ-pivot mechanism lets you rotate either ear cup up to 180 degrees, which frees up one ear to hear outside sound. A single-sided, flat elastomer cable resists tangling, and a one-button mic/remote lets you take calls from your Android™ device without taking the headphones off. A twist-lock mechanism secures the detachable cable when it’s connected to the ear cup, and a rugged strain-relief connector dampens resonance that can adversely affect sound quality. Bold styling, including brushed stainless-steel ear-cup and headband accents, makes J55a headphones an aesthetic, as well as acoustic, triumph. An extension ring on the jack accommodates most smartphone cases, so you stay connected and your phone stays covered. And a padded carry pouch protects the headphones when they’re not on your ears. Now great JBL sound goes wherever you go. J55a is rated 3.6 out of 5 by 9. Rated 5 out of 5 by malam from Great Product for the price I bought it 2 weeks back and I am enjoying it so far and liked it very much. Previous ones of other brands were not good. I am happy with this one. Rated 4 out of 5 by Nurdis00 from Many options in the head phone market They block outside noise pretty good and go loud. The wire doesn't stay in the clip very well. As far as comfort they are not as comfortable as the Tim McGraw signature head phones I purchase from Harmonaudio. To summarize, I am glad I purchased these refurbished and did not pay full retail. do these headphones work on ipones and ipads. Yes. The J55A would work well with iPhones and iPads, though there is a model that would be a better fit, which is the J55I that has a three-button remote that is only compatible with iOS devices. Hi , where i can find a new foam paddings for this headphones. Thank you for your inquiry. Please reach out to your local JBL customer service at https://uk.jbl.com/support-product.html for information regarding Parts replacement, thank you!